The Pakistani American playwright Ayad Akhtar burst onto the theater scene in 2012 with “Disgraced,” a smartly crafted, concise, emotionally taut first play that was followed last season by “The Invisible Hand,” a breath-stopping thriller that again displayed the skillful dialogue and efficient story-telling of “Disgraced” while raising the tension bar several notches. Akhtar’s third play, “The Who & The What,” written in 2014, now occupies the stage at Victory Gardens. It verges on ethnic sitcom. Like its two predecessors, “The Who & The What” deals, broadly speaking, with the conflict between Muslim heritage and mainstream American culture. In “Disgraced,” set in New York, it’s the disillusionment of a high-powered Pakistani American lawyer whose best intentions blow up in his face; in “The Invisible Hand,” set in Pakistan, a kidnapped American banker finds himself caught in the middle of a jihadist power play. Afzal, a middle-aged Muslim from Pakistan whose wife has died of cancer, shares his American home with two adult, thoroughly Westernized and still-unmarried daughters, the brilliant, 33-year-old Zarina, an aspiring writer, and her younger sister Mahwish, who spews malapropisms and aspires mainly to be married. Old-school Afzal goes online to find a suitable husband for Zarina and comes up with a white American convert to Islam. Amid comedy that sways from gentle to slightly edged, he pushes his candidate, Eli, onto his reluctant daughter. All goes well enough until, with Eli’s encouragement, Zarina finishes writing her long-stalled book on the human frailty (to put it mildly) of the prophet Muhammad – and the manuscript falls into her father’s hands. In a blink, what has been substantially a comedy (if not of manners, then of clashing cultures) ceases to be funny. Well-meaning Afzal implores Zarina to destroy the manuscript, reminding her that back in the old country she would be killed for writing such things. When Zarina proves implacable, Afzal drops the hammer. This daughter, like Tevye’s third child, has crossed a line. 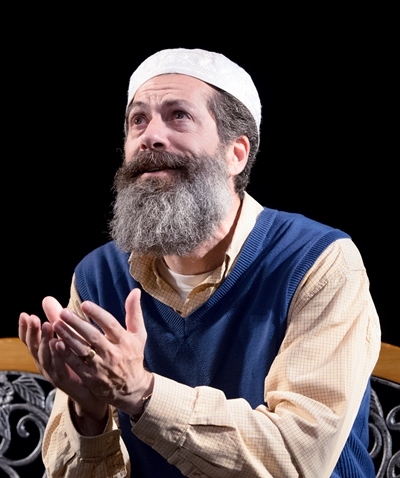 But again as in “Fiddler,” love allows room for a blessing. It’s neither original nor especially compelling stuff. The two sisters are stock, two-dimensional types: Zarina (Susaan Jamshidi) bookish, liberated, impatient with her father’s conventions; Mahwish (Minita Gandhi) flighty, shallow, submissive. 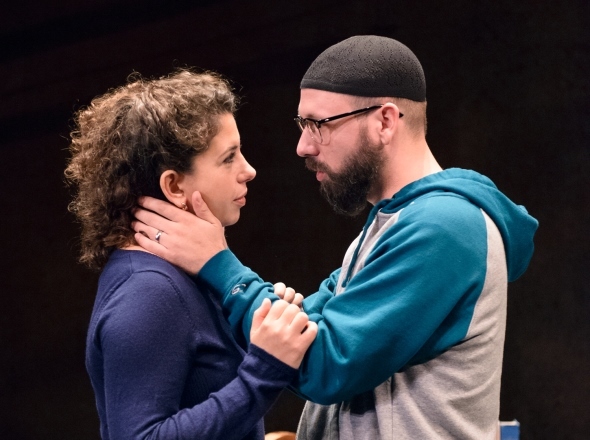 Shane Kenyon, as the convert Eli, has the one scene that blazes at the playwright’s potent best when he stands toe to toe with Rom Barkhordar’s Afzal in fierce defense of Zarina. Despite Zarina’s willfulness, and the propensity of a Western audience to side with her independent spirit, it is Barkhordar’s bear of a man who more fully engages the viewer. Afzal is a cultural transplant, a widower still suffering the pain of that loss, an old-world patriarch doing what he believes in his heart is right for his daughters. We may regard that entrenched world view as oppressive, even outrageous, but he is Akhtar’s most sharply drawn character here. The play’s big picture seems skewed. Scott Davis’ minimal sets – a kitchen bar, a small table to suggest a café — smack of budgetary constraints and a paucity of imagination. Director Ron OJ Parson summons much from scenes of real depth or wit, but there’s just too little of substance here for even such a competent hand to spin into durable cloth. 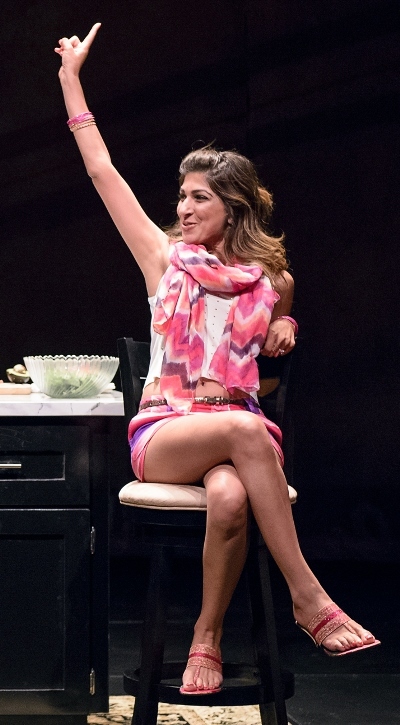 Akhtar’s “Disgraced,” which played Lincoln Center and then Broadway after its Chicago premiere in 2012 (glad to say I managed to see all three versions), will open the Goodman Theatre season in September. And here’s betting that either Goodman or Steppenwolf snaps up “The Invisible Hand” within the next couple of years. That will get your heart pumping.